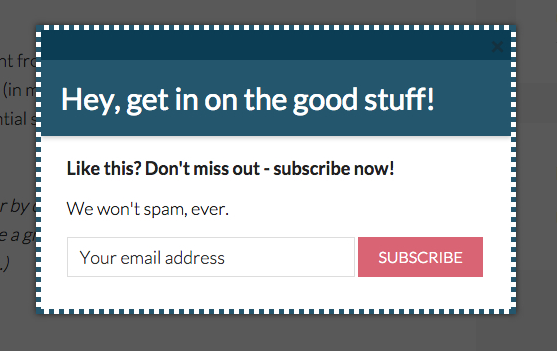 We want to bring one of our other (free) plugins to your attention: Scroll Triggered Boxes. It offers seamless integration with our Mailchimp for WordPress plugin and we think it's a great tool to grow your lists at an ever faster rate. The name may suggest it already but using Scroll Triggered Boxes you can show pop-up or slide-in boxes at just the right time. You could use it together with Mailchimp for WordPress to show a sign-up form for your Mailchimp list once a visitor scrolls down to your comments section, or the end of your post. Visitors that scroll down to the end of your content most likely got some value out of it. That makes this the perfect time to engage with them and ask them to take a certain action: subscribing to your newsletter in this example. Having the box slide in at a corner of the screen as opposed to having it overlay the content is way less obtrusive, for which your visitors will be grateful. As our brains are wired to notice movement, the slide-in motion is still a sure way to get your visitor's attention. It's free, so what's in it for us? The plugin itself is 100% free and has been around for a while now. Over 10.000 sites are happily using it. Recently, we added a paid plan which give you access to a range of premium add-ons that extend the functionality of the free Scroll Triggered Boxes plugin. The add-ons are pretty new so we're very open to suggestions for premium functionality while keeping the free plugin awesome (it got nothing but positive reviews so far). Anyway: please have a look and try Scroll Triggered Boxes for yourself. It does wonders for your sign-up rates. PS. To show a sign-up form inside your pop-up or slide-in box, simply use the [mc4wp_form] shortcode in the box content. As of May 2016, Scroll Triggered Boxes is now known as Boxzilla.